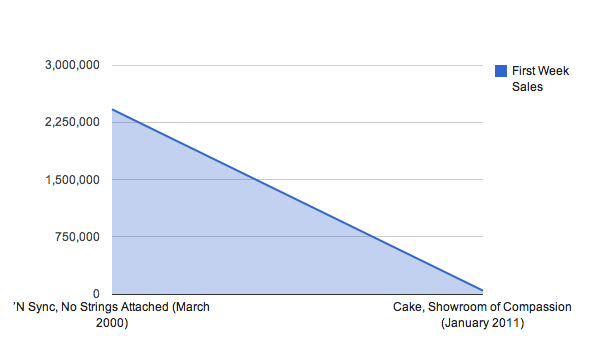 This week, Cake has the No. 1 album on the Billboard chart. I know, right? However, they made it there with the lowest-selling No. 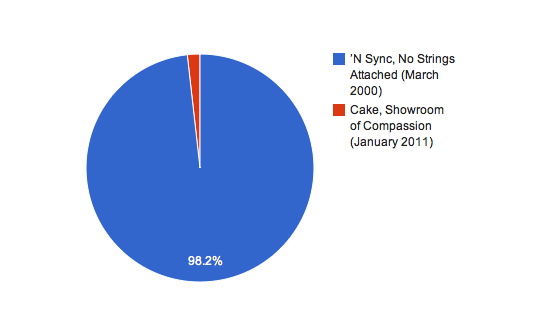 1 opening of all-time: "Showroom Of Compassion" sold just 44,000 copies in its first week. In March of 2000, 'N Sync set the record for the biggest-selling No. 1 opening of all time with "No Strings Attached," which moved 2.4 million copies. Here, now, are three different Google charts about those numbers. It's science.